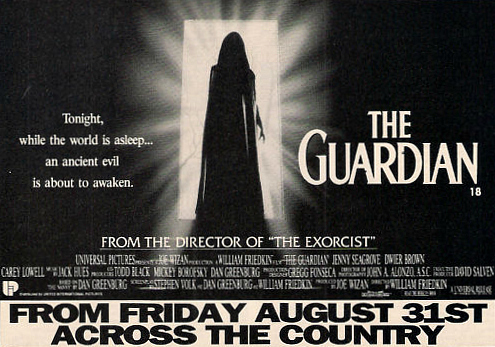 The Guardian, a horror film from 1990, tells the story of a woman named Camilla (Jenny Seagrove), who is hired as a nanny and proceeds to not only claim the baby as her own but also tries to seduce the baby’s father away from his wife. There are a lot of possibilities, largely because The Guardian is a notorious mess. It was directed by William Friedkin, the man who literally jump started modern horror with The Exorcist, but it is probably not a coincidence that Friedkin didn’t even mention The Guardian when he wrote his highly acclaimed autobiography, The Friedkin Connection. There’s very little that Friedkin doesn’t discuss in that book so the fact that he specially didn’t mention this film speaks volumes. Reportedly, there were problems on the set. From what little I’ve found online, it would appear that Friedkin originally wanted the movie to be about a mentally deranged woman who thought she was a druid. But the producers wanted a horror film about a woman who actually was a druid. Somehow, this eventually led to The Guardian becoming a movie about a woman who is actually a tree. What’s funny is that the film itself feels like a typical crazy nanny Lifetime film, up until the moment that one of Camilla’s employers attempts to take a chainsaw to that tree. Of course, before all that happens, Camilla is killing people left and right but yet no one seems to notice. She doesn’t make any secret of the fact that she’s trying to seduce Phil (Dwier Brown) but Phil’s wife, Kate (Carey Lowell), doesn’t seem to care. Instead, Phil and Kate attempt to set Camilla up with their friend, goofy Ned (Brad Hall). It doesn’t take long for Ned to get devoured by a bunch of wolves. That’s what happens when you walk in on a druid nanny turning into a tree, I guess. There’s also an odd scene in which three gang members just happen to be walking through the woods when they come across Camilla and the baby. They kind of pop up out of nowhere and they immediately turn out to be some pretty bad guys. Luckily, a tree pops up and kills the all. Is the tree Camilla or is the tree someone else? Who knows? Even stranger is the fact that no one notices anything strange about Camilla. To be honest, there are times that Camilla might as well be wearing a sign that reads, “Druid” but no one seems to notice. Then again, it’s debatable whether or not she was actually a druid. She might actually be a tree and I guess it’s understandable that something like that wouldn’t naturally occur to anyone. I mean, I think we’ve all probably met a druid or two but someone who is actually a tree? Well, that’s unusual. Anyway, The Guardian is a messy film and I’m afraid that I’m probably making it sound more fun than it actually is. If you do watch it, please be sure to chime in with your thoughts on whether or not Camilla is actually a tree. I look forward to hearing your opinion!